Available immediately, Swedish heavy metal titans Amon Amarth (Metal Blade Records/Sony Music International) - in partnership with Swedish video game developer and publisher Ride & Crash Games AB - has unleashed a new Amon Amarth mobile video game. (3) your fighting spirit is always high thanks to Amon Amarth's epic music in retro style blasting from over the horizons and into your ears. 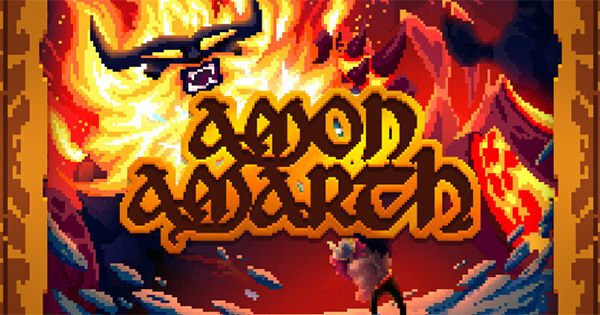 The unique game features four worlds, four epic battles, 12 unique levels and 13 different Amon Amarth tracks with retro video game sounds. The game is available worldwide to the public for iOS and Android Phones and Tablets for a retail price of $8.99. The idea for the game was conceived in the fall of 2015 when Robert Chirico Willstedt, a video game producer in Stockholm and founder of Ride & Crash Games AB, met Amon Amarth. Robert and the band bonded over epic amounts of beer and a common love of video games, and they started discussing how cool it would be if they could create a video game for Amon Amarth. There and then, the idea was born of a retro style Viking platformer with Amon Amarth music in '80s sounding square wave format. Robert hand-picked a team of developers and designers to realize the game concept. The band met the development team continuously during the development process to ensure the end product would stay true to the initial vision of the game. This is an authentic Amon Amarth product.